The HASTAC initiative and MacArthur Foundation support a Digital Media and Learning Competition. They're doing an interesting thing this year: applications have been submitted, and they are not gathering public comments on each application. 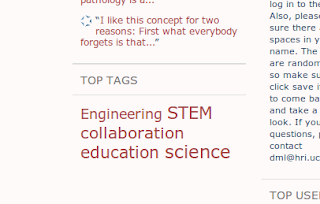 When I looked, it caught my eye that the top tags in their tag cloud of comments were "engineering", "STEM", "collaboration", "education" and "science". Kind of spells Harvey Mudd College...but we don't seem to have an application in. Well, maybe next year! "The theme of this year's Competition is Reimagining Learning and there are two types of awards: 21st Century Learning Lab Designers and Game Changers. Each category will include several Best in Class awards selected by expert judges, as well as a People’s Choice Award selected by the general public. The online application system will open on January 15 and will include three rounds of submissions, with public comment at each stage. Please see www.dmlcompetition.net for all details."